July is just around the corner and the Government’s new Child Care Subsidy will come into effect on July 2nd. Well around one million families are set to be better off under the new scheme as it offers more support to families on low and middle incomes. That’s fantastic news for families that have previously had the desire to send their kiddo's off to child care but perhaps it has been out of reach financially. They’re now in a better position to give their kids a good start at an early education. Here's the low down of what you need to know! The new Child Care Subsidy will replace the current Child Care Benefit and Child Care Rebate and will be paid directly to your nominated child care service. · A family’s combined annual adjusted taxable income will determine the percentage of subsidy they are eligible for. · An activity test will determine how many hours of subsidised care families can access, up to a maximum of 100 per fortnight. · Your centre’s daily fee will determine the hourly rate cap. If your current child care service charges a daily fee, the hourly rate will be determined by dividing the daily fee by the hours the service operates. So, finding a child care centre that tailors their service into sessions will help you optimise your subsidy and help reduce the risk of running out of eligible hours and paying full fees. Let's face it, we all want those extra $$$ in our pockets. Goodstart Early Learning has introduced both 9 and 10 hour sessions in addition to their all-day sessions to help families make the most of their subsidy and minimise out of pocket expenses and make early learning more accessible. And with over 650 locations Australia wide you’re sure to find a centre to meet your needs. Goodstart understands that one size doesn’t fit all families and have many options to suit your family’s lifestyle without having to compromise on care. No two families are the same and not all families need 12 hours of care each day. Simply choose the number of hours of child care your family needs, and get the most out of the Government Child Care Subsidy. Want to work out your subsidy? Find out more here. Lulu spent her child care years at a Goodstart Early Learning Centre and I’m so excited to be sending Marley to one soon. Lulu still talks about her days at Goodstart and reminisces about the friendships she made and things she learnt. We are still very close to one of the educators that she bonded with instantly. She became an extension of our family. Lulu's days at Goodstart have carried through with her into her school years and will forever have a special place in her heart. Goodstart's educators build genuine, long lasting relationships with their families. It's that collaborative experience between educators and family that makes the environment a healthy, happy place for your kiddo's to thrive and learn. For us we were really appreciative of the care that goes into communication. I was really nervous for the first few weeks, Lulu had always been with me and sending her to child care was a big deal for me. But knowing I could ring and check in on her gave me piece of mind. And when I went to pick her up in the afternoon there was detailed notes about her day. Everything from what she ate, what she learnt, how she behaved was documented. It made me feel like I wasn't missing out, like I was still involved in her day. 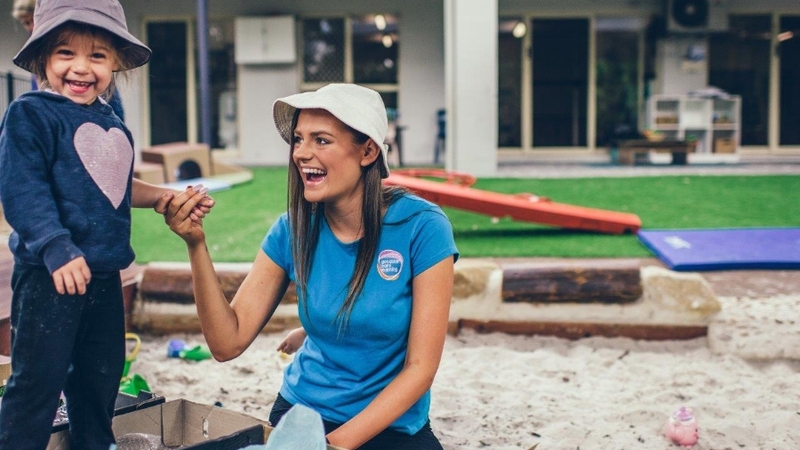 I love that Goodstart is a not-for-profit organisation that puts its resources back into their beautiful centre environments, people, education initiatives and local communities. The community vibe is important and you feel it as soon as you walk into one of their centres. It's warm, inviting and homely. Goodstart delivers structured programs designed to help children reach their full potential. We all know that high quality early learning has positive, long lasting effects on our kiddo's. And social interactions with their peers help build lifelong valuable skills. And that's where Marley is at right now. She needs to start socialising and learning from her surroundings. After a rocky start in life it's time to set her on her own journey and I know Goodstart is the best environment for it to begin. Goodstart's vision is simple. Children are central to everything they do. It's all about the kiddo's and giving them the tools they need to be a valued member of the community. What more could you ask for as parents? And now with the new sessions in place at my local Goodstart Early Centre I know our family will be looked after financially too. Peace of mind is everything in this hectic, fast paced world we live in. If your keen on checking out a Goodstart Early Learning Centre near you book a tour here or call 1800 222 543.